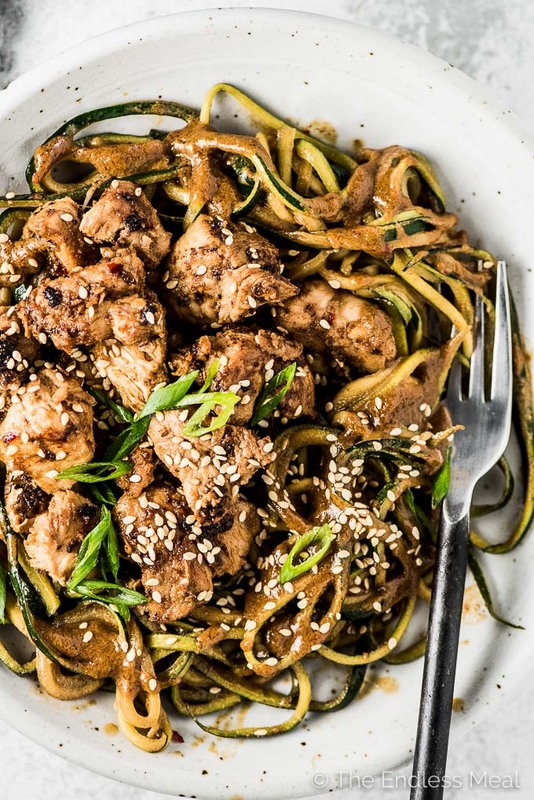 Spicy Sesame Chicken Zoodles are easy to make and so delicious. The creamy tahini-based sesame sauce does double duty as the marinade in this 20-minute dinner recipe. You will LOVE it! We're bringing back the chicken zoodles … again! Guys, I just can't get enough. I sure hope you feel the same way. This time we're marinating the chicken in a creamy sesame sauce then using the rest of it to smother the zoodles. One sauce + two uses = a super fast dinner. Everyone needs at least a few healthy 20-minute dinner recipes in their back pocket. Sometimes we just don't have the time or energy to cook. I get it! Whipping up a simple meal like this will leave you feeling great and take next to no time. Fork twirlable zoodles are da bomb. Guys, I seriously love them. I know that they're not exactly like traditional pasta, but they wrap themselves around my fork and make me feel like I'm carb loading. It's the best. 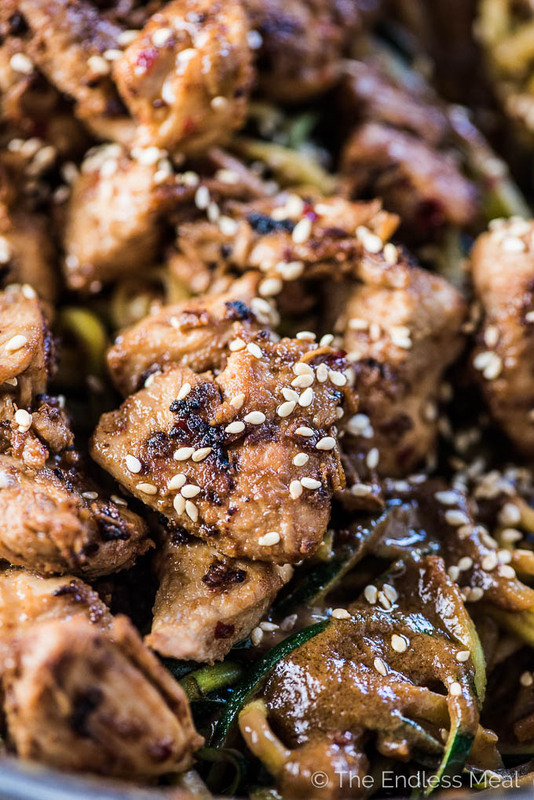 The creamy sesame sauce is everything. It's a little bit spicy (although with some extra garlic chili sauce it could be burn your mouth off spicy. your choice.) and deliciously creamy from a scoop of tahini. 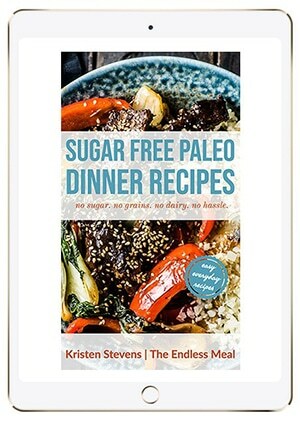 It's made with flavor powerhouses like soy sauce (or coco aminos), sesame oil, ginger, and garlic. There's big-time flavor going on here. Healthy + easy to make + delicious = everything I love in a recipe. This is totally a no-brainer kind of recipe. And I bet you have most of the ingredients in your kitchen waiting for you to turn them into sesame zoodles. Pop some chicken and zucchini on your shopping list and you'll be good to go. Make the sauce/ marinade. I like to use a glass 2-cup measuring cup because then I can just pour 1/2 cup of the sauce over the chicken without having to dirty another measuring cup. 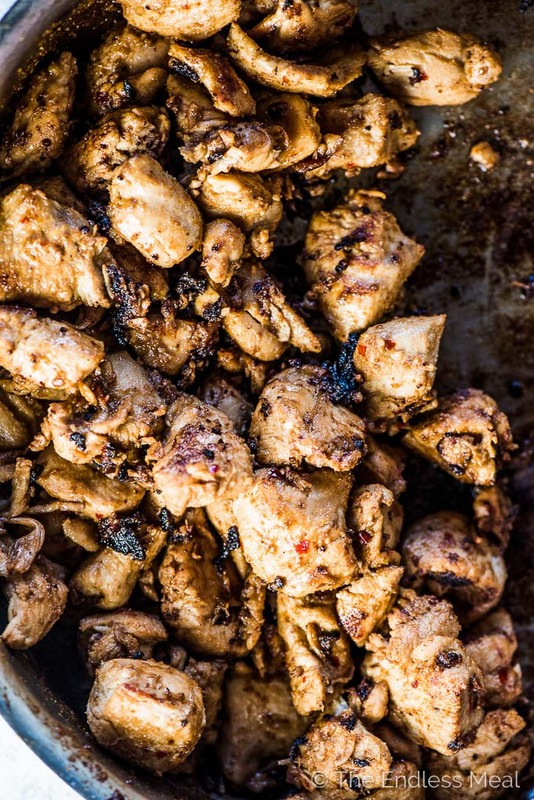 Chop the chicken breasts and put them in a bowl. Pour some marinade over them and give them a toss. While they sit and marinate for a few minutes, spiralize the zucchini. Now all you have to do is cook the chicken then add the zucchini and the rest of the sauce to the pan for a few minutes. 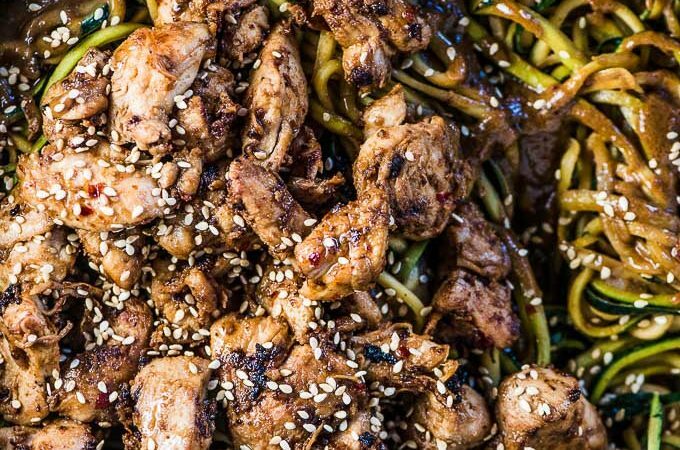 Now go pat yourself on the back and dig into your sesame chicken zoodles. You've made a healthy dinner in 20 minutes flat, my friend! ♡ Go vegan and celebrate meatless Monday by swapping some firm tofu for the chicken. ♡ Keep it all chicken and zoodles but use chicken thighs. ♡ Spiralize some carrots or do a mix of carrot and zucchini noodles. 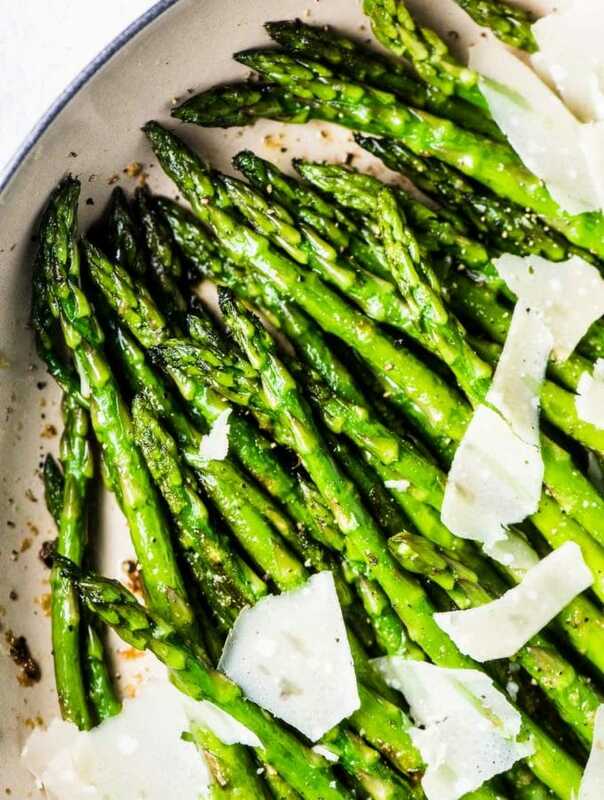 ♡ Go crazy on the garlic and ginger. ← this is a really good idea. Mmmm ginger! 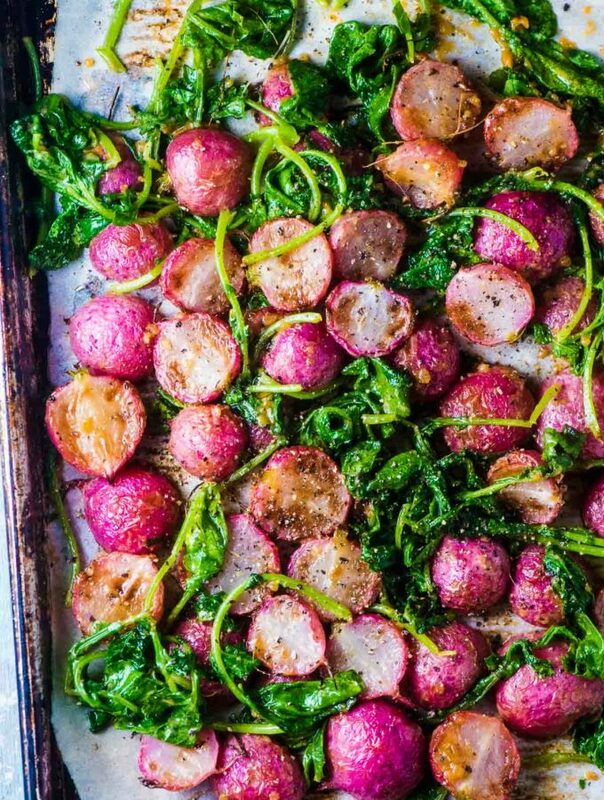 ♡ Add some extra veggies to the pan. I think broccoli and red peppers would be delicious! ♡ Skip the tahini and add almond butter or peanut butter instead. Both would be delicious. 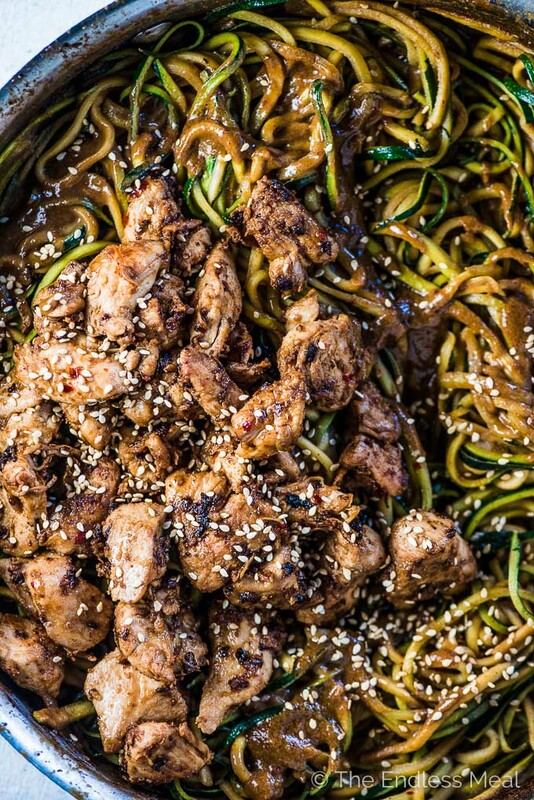 Can you think of any other ways you could customize your sesame chicken zoodles? Let me know. I'd love to hear your ideas! Mix all the sesame sauce ingredients together. Place the chicken breasts in a bowl and pour 1/2 cup of the sauce over the top. Mix the chicken then set it aside to marinate while you spiralize the zucchini. Heat 1 teaspoon of sesame oil in a large pan over medium-high heat. Add the chicken and all the marinade to the pan. Cook, occasionally scraping the brown bits off the bottom of the pan, until the chicken is cooked through, about 10 minutes. Add the remaining teaspoon of sesame oil and the zucchini noodles and the sauce to the pan and cook until the noodles are soft, about 5 minutes. There seems to be a teaspoon of sesame oil left over or did I miss something? I’m a bit disappointed—mine looks nothing like the picture. My chicken did not brown, just simmered, and the zoodles added so much liquid to the pan while cooking that it diluted the sauce too much. Maybe I should have cooked the zoodles separately? These zoodles are great! I love the sesame flavor. Will make again. I’m so happy they were a hit!! For those who are intolerant to gluten, you may want to point out that most soy sauce brands are not gluten free and they’ll need to use a gluten free one. You are absolutely right! That’s normally something I mention in the recipe but this one looks like it was missing that. I’ve made note of that now. Thank you for pointing that out!